(DEL MAR, CALIFORNIA, USA) – The Del Mar paddock sale was billed as a place to buy ready-made racehorses, but it was Heir Kitty’s broodmare value that made her the $750,000 sale topper. The grade I winner could continue racing in this country, but she is ultimately destined for Japan and life as a broodmare. Emmanuel de Seroux’s Narvick International signed the ticket for Heir Kitty on behalf of an undisclosed Japanese buyer. Steven Venosa’s SGV Thoroughbreds consigned the 4-year-old daughter of Wildcat Heir—Be Silver, by Silver Buck, for David Bernsen and Paul Makin. 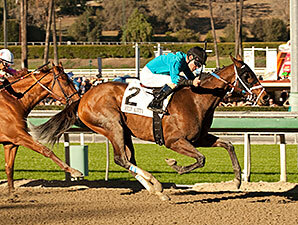 Heir Kitty won the 2013 La Brea Stakes (gr. I) at San Anita Park and has earned $421,272. Many of the other horses sold at the paddock sale could very likely run at the Del Mar meet, which opened July 17 and runs through Sept. 3. It was the third year that Barretts Sales & Racing and Del Mar Thoroughbred Club have conducted the sale, designed to bring horses into the Southern California racing circuit. The sale averaged $113,000, with 19 horses grossing $2,147,000. The average rose 52.8% over 2013, when 17 grossed $1,257,000 and averaged $73,941. Ten of the 29 horses through the ring didn’t sell, for a buy-back rate of 34.5%. Lloyd said that Barretts plans to conduct a similar sale this fall in conjunction with the new Del Mar autumn race meeting. Venosa, whose consignment included three other six-figure horses, was pleased with the sale. Sushi Empire, winner of this year’s Blue Norther Stakes at Santa Anita, was the second-highest price, bringing $275,000. Sweezey and Partners sold the 3-year-old daughter of Empire Maker—Dowell House, by Danzig. Trainer Tevis McCauley of Lexington, Ky., bought Sushi Empire on behalf of his father, Ron, and his brother, Nathan. Campaigned by Wounded Warrior Stable, the 3-year-old filly has earned $96,270 with one victory and four placings from 11 starts.